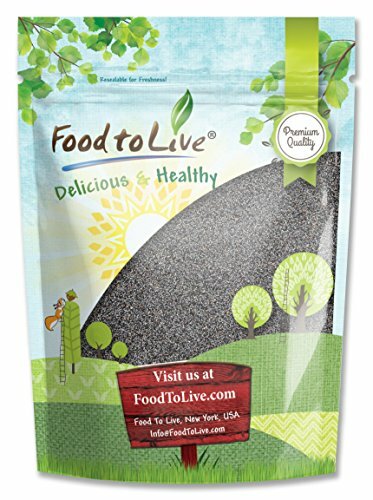 Food to Live Poppy Seeds are beautiful, natural, and full of deliciously rich flavor. They are often used in Turkish sweets, European pastries, and Indian sauces. Poppy seeds are greatly beneficial to your health as they are full of antioxidants and dietary fiber. Nutritional Value Poppy seeds are rich in B vitamins and a variety of minerals. They contain extremely large amounts of: - Calcium - Iron - Copper - Manganese - Phosphorus - Magnesium Directions Most often used as a condiment, Poppy Seeds are a popular ingredient in many cuisines. You can enhance the flavor of your baked goods by sprinkling some seeds on top of the dough. Poppy seeds can be ground into sauces or used as stuffing in confectionaries. This product is processed in a facility that also processes tree nuts and wheat. 100% natural Poppy Seeds offer many benefits to your health. If you have any questions about this product by Food to Live, contact us by completing and submitting the form below. If you are looking for a specif part number, please include it with your message.